Are VpsBenchmarks tests influenced by VPS providers payments? What's the difference between managed and unmanaged VPS? 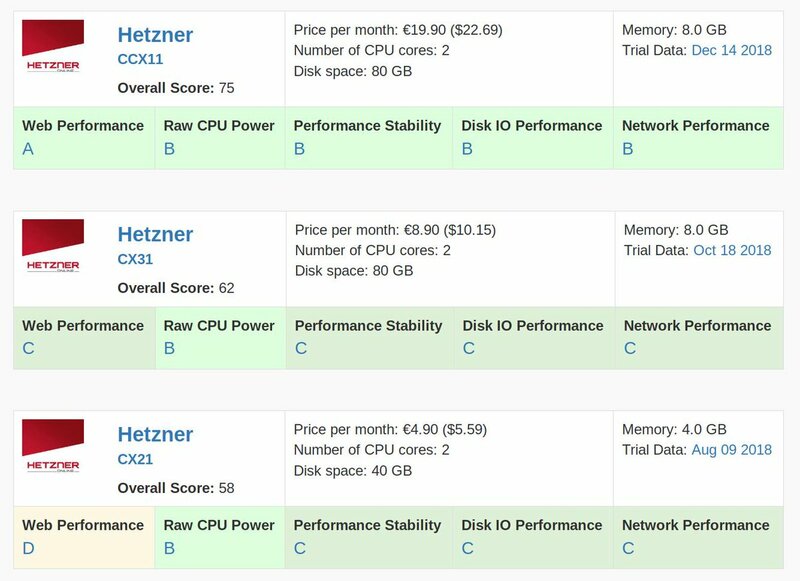 Why is VPS performance important? 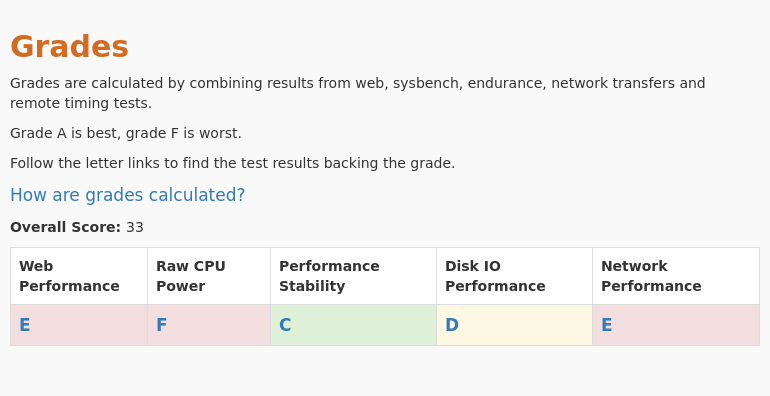 What are VpsBenchmarks web performance tests? What are VpsBenchmarks sysbench tests? What are VpsBenchmarks endurance tests? What are VpsBenchmarks remote timing tests? What are Featured Providers and how to enroll? VPS is the acronym for Virtual Private Server. It's a virtual machine that is using the resources of a fraction of a physical server. It runs its own OS and appears to operate as a fully independent machine for most purposes. A vast number of Internet Service Providers offer VPS for rent either by the second, the hour or the month. The provider gives you root access to the VPS so that you can install and run any software you need. All VPS are constrained by their size: they are only allocated a predefined number of CPU cores, memory space and disk space. The higher the numbers, the more expensive the VPS will be. While memory and disk are fully dedicated to the VPS, the CPU cores may be shared with other VMs running on the same physical host, leading to varying performance. No. VpsBenchmarks receives funding through advertisement and Featured Providers but all tests for all providers are conducted in the exact same conditions. A managed VPS comes with a control panel such as cPanel or Plesk that facilitates software installation and management on the VPS and make root console access unnecessary. The applications that the control panel manages are typically a database (mysql), Worpress, Joomla... The control panel will also manage emails and user accounts. A managed VPS might also come with a CDN, DDos protection and backups. Support for a managed VPS will be more available and proactive in most cases. Managed VPS are substantially more expensive than the unmanaged kind. Unamanaged VPS on the other hand don't usually give you any of those tools, you can still setup the same applications as in unmanaged VPS but you have to install them yourself usually through the command line. You won't get any provider support if they stop working. Unmanaged VPS still get support but only at a low level. They will help you if the VPS entirely breaks, if you can't connect to it or if it gets disconnected from the internet for example. The best unamanaged VPS still provide some form of monitoring, backups and DDos protection. We exclusively test unmanaged VPS. In all cases, it matters because of the cost. A VPS from provider A that costs $10 a month can give you double the capacity of a VPS from provider B at the same price. In other words, to do the same amount of work, you might need to buy 2 VPS for a total of $20 from provider B when could spend only $10 with provider A. Then there is the user experience. If you are using your VPS as a web server, the response time can vary dramatically from one provider to the next. Users are very sensitive to the time it takes to load a web page. If it takes more than 3 seconds, many users will simply give up on your website and move on to the next result in the Google Search page. A fast VPS can make the difference between a site that loads in 2 seconds and one that loads in 10 seconds. Google page ranks will also be influenced by the speed of the web server running on the VPS. A slow responding server will be penalized. During the web performance tests, a web server running a ruby on Rails web application runs on the VPS and serves anywhere between 100k and 200k requests per day. While it is running, we collect performance and system metrics such as the server response times (average, percentiles, ...) and cpu usage, iowait, cpu steal. The website is public but we don't disclose its name to prevent anyone from interfering with the results. None of the website traffic is generated by VpsBenchmarks. Web response time are measured from within the VPS, meaning that they exclude network latency, TCP connection and HTTPS handshake time, leaving only the web application response time. What are VpsBenchmarks Sysbench performance tests? The Sysbench test suite test various aspects of the VM individually, namely the CPU, the disk and memory components of the machine. 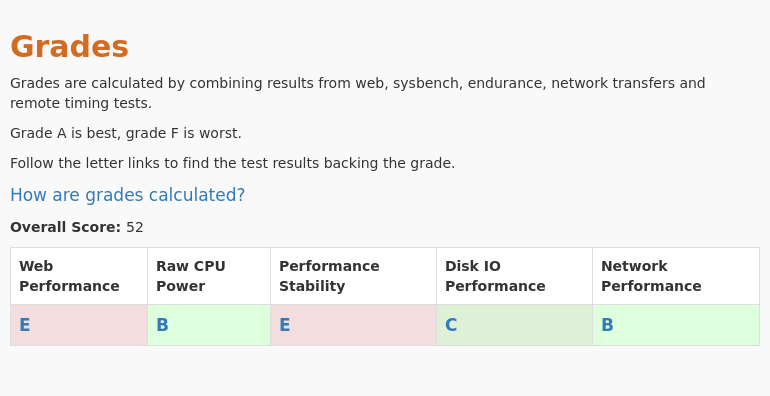 We run the Sysbench tests after the web tests have completed to avoid any interference. In the case of VPS that implement a CPU credit balance system, we wait until the balance is above it's starting value before running the sysbench test. What are VpsBenchmarks endurance performance tests? The goal of the endurance tests is to determine if the VPS can sustain prolonged CPU utilization without degrading and what's the total amount of work the CPU of the VPS can accomplish during the test. The endurance test lasts for 24 hours, it pushes the CPU to 50% use and VpsBenchmarks records the amount of work that's done during every 10 minute interval as well as system metrics. Over allocated VPS as well as those that throttle the CPU will be be easily identified in the results of those tests. What are VpsBenchmarks remote timings tests? As the web performance tests are running, VPSBenchmarks also collects the web response times from 5 locations throughout the world. The remote web response times are decomposed into DNS lookup, connection, TLS handshake latencies and HTTP response. The further the client is from the VPS server, the higher those latencies will be. Latencies will also be influenced by the quality of the network link provided by the VPS provider. To be featured at vpsbenchmarks.com, contact us using this form. Guaranteed VPS tests for plans chosen by the provider. Appear above non featured providers on the VPS Screener page. Direct links from vpsbenchmarks.com to your own website. Appear prominently on vpsbenchmarks.com landing page along with other featured providers. Providers who already have an affiliate program paying a minimal monthly cash amount are automatically "Featured". Others must pay a monthly subscription fee. The price is set at $30 per month and includes 1 guaranteed test per quarter. $60 for 2 guaranteed tests, etc. For some providers, we ran a smaller set of tests: Sysbench and Network Transfers only. Those providers don't show up in the Screener or in the main list of providers in comparison pages, but they have their own provider page and details of all their performane tests are available as well. Their performance can also be compared to any other provider in the Sysbench and Network Transfers comparison pages.